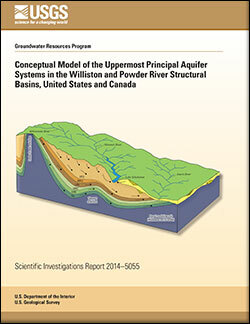 The development of two nationally important energy-producing areas, the Williston structural basin (containing the Bakken Formation) and Powder River structural basin, provide a critical opportunity to study the water-energy nexus within a groundwater context. Large volumes of water are needed for energy development in these basins. 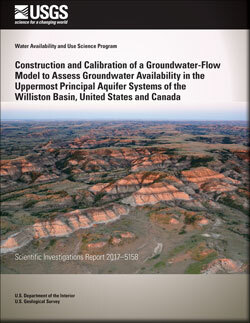 The hydraulically connected aquifers in the regional glacial, lower Tertiary, and Upper Cretaceous aquifer systems are the shallowest, most accessible, and in some cases, the only potable aquifers within the Northern Great Plains. 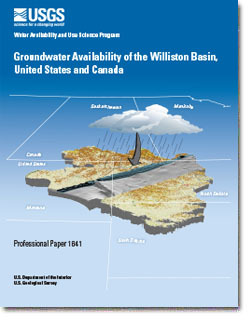 This study area is supported by the USGS Water Availability and Use Science Program (previously the Groundwater Resources Program) to assess and quantify the availability of the Nation’s groundwater resources. 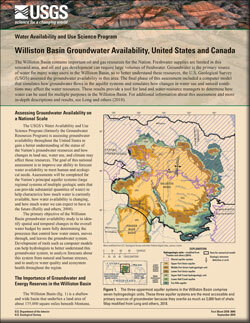 The purpose of the Williston and Powder River Basins groundwater availability study is to quantify the current groundwater resource, as part of a USGS National assessment. The overall objective of this study is to assess the groundwater resource, particularly as energy resources are developed. 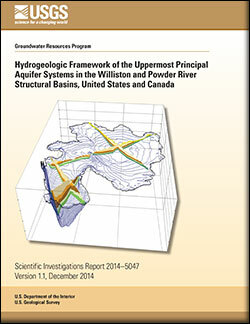 This objective will advance tools, information, and conceptual understanding of this areally extensive regional transboundary aquifer system. Williston structural basin. Develop a hydrogeologic framework, estimate hydrologic budget components, refine the conceptual model of groundwater flow, and numerically simulate the regional groundwater flow for the glacial, lower Tertiary, and Upper Cretaceous aquifer systems. Powder River structural basin. Develop a hydrogeologic framework, estimate hydrologic budget components, and refine the conceptual model for the lower Tertiary and Upper Cretaceous aquifer systems. Feltis, R.D. ; Lewis, B.D. ; Frasure, R.L. ; Rioux, R.P. ; Jauhola, C.A. ; Hotchkiss, W.R. Selected geologic data from the Northern Great Plains area of Montana; 1981; OFR; 81-415; Feltis, R. D.; Lewis, B. D.; Frasure, R. L.; Rioux, R. P.; Jauhola, C. A.; Hotchkiss, W. R.
MODFLOW-NWT model of predictive simulations of groundwater response to selected scenarios in the Williston Basin, United States and Canada can also be found online. Clinker is formed when rock units that overlie exposed burning coal seams are baked and fused. The red and brown clinker is more resistant to erosion than non-baked adjacent Tongue River Formation sandstones and forms caps of many plateaus and buttes. Photo taken north of Lame Deer, Montana. Landscape near the northern Theodore Roosevelt National Park is characterized by the eroded Fort Union Formation.Photo is taken along Highway 85. Clinker is formed whn rock units that overlie exposed burning coal seams are baked and fused. The red clinker is more resistant to erosion than non-baked adjacent Fort Union Formation sandstone and forms the caps of many plateaus and buttes. The white stone outcrop is the Tongue River Formation. Photo taken north of Lame Deer, Montana. Lake DeSmet north of Buffalo, Wyoming. The lake occupies a depression formed by the natural burning of the 150-200 foot thick Lake DeSmeth coal zone in the Wasatch Formation. Upper Lebo Member of the Fort Union Formation. Photo taken fro the top of Cow Creek Buttes in the Burnt Hollow BLM recreation area about 20 miles northeast of Gillette, Wyoming. A new study by the USGS Northern Rocky Mountain Science Center and the NPS Greater Yellowstone Network has shown that contamination of wetlands by brine had negative effects on plant productivity and macroinvertebrate communities. The presence of non-native plant species is significantly greater adjacent to oil well pads than in non-developed areas of the Williston Basin, according to a first-of-its-kind U.S. Geological Survey study for this area.